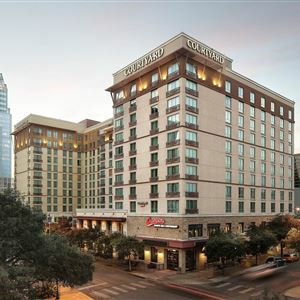 Located in Austin (Downtown Austin), Courtyard by Marriott Austin Downtown/Convention Center is minutes from Mexic Arte Museum and Museum of the Weird. This hotel is within close proximity of Frost Bank Tower and Esther's Follies. Make yourself at home in one of the 270 air-conditioned rooms featuring flat-screen televisions. Complimentary wired and wireless Internet access keeps you connected, and cable programming provides entertainment. Private bathrooms with shower/tub combinations feature complimentary toiletries and hair dryers. Conveniences include desks and coffee/tea makers, and housekeeping is provided daily. Enjoy a range of recreational amenities, including an indoor pool, a spa tub, and a fitness center. This hotel also features complimentary wireless Internet access, gift shops/newsstands, and wedding services. Featured amenities include a business center, express check-in, and express check-out. Planning an event in Austin? This hotel has 6,600 square feet (1 square meters) of space consisting of conference space and meeting rooms. Self parking (subject to charges) is available onsite.